The Award Winning ‘Rule The World’ has been recognised as the Number 1 ‘Take That’ tribute show in the world! The cast recently appeared alongside THE REAL ‘TAKE THAT’ on BBC1’s ‘The Graham Norton Show’ and after hearing Dan Maines (Gary), a stunned Gary Barlow said in amazement “He sounds like me!”. The real Gary then also praised the whole band saying “They’re very good these guys!” – not an easy statement to acquire from the former X Factor judge. This production will take you through the musical highlights of ‘Take That’s’ career. From the moment the fresh faced boys first stepped on stage in the early 1990’s, to Robbie’s huge success as a solo artist selling out 3 nights in Knebworth. The show also features the hugely popular 4 piece years and the big reunion everybody’s was waiting for in 2010 when all 5 members of ‘Take That’ reunited for a brand new album and tour. The show is an accurate portrayal of Take Thats concerts through the years. The night features all the biggest hits including ‘Never Forget’, ‘Greatest Day’, ‘Back For Good’, ‘Relight My Fire’, ‘Could It Be Magic’, ‘Shine’, ‘Pray’, ‘Rock DJ’, ‘These Days’, ‘Let Me Entertain You’, ‘Everything Changes’ ‘It Only Takes A Minute’ and many more. With the accuracy in mannerisms and vocals, this show will leave you questioning whether you just saw the real thing. You will get the feel and look of all their biggest arena tours… in a far more intimate, close-up setting! 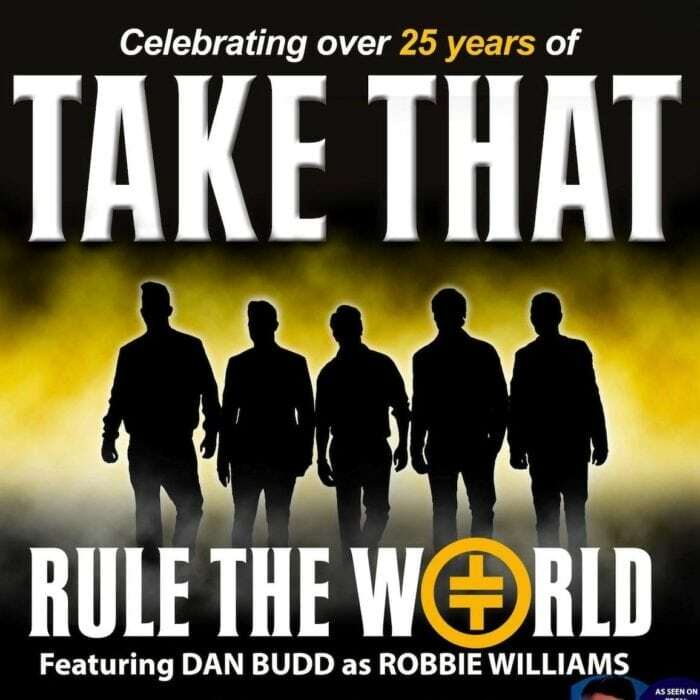 For this tour, the fantastic Robbie Williams tribute act Dan Budd is joining the ‘Rule The World’ cast. Dan was a contestant on BBC1’s ‘Let It Shine’ and head judge Gary Barlow was amazed by him. He commented “You are an amazing impersonator and it’s unbelievable how much you look and sounds like Rob”. If you like ‘Take That’ you will LOVE ‘Rule The World’. With a fan base transcending age groups and nationalities alike, adoring fans will be left singing and dancing in the aisles within minutes. Prepare to be amazed and transported back throughout the past 25 years of ‘Take That’ magic.